I think I can do this. I'm going to give it a try. 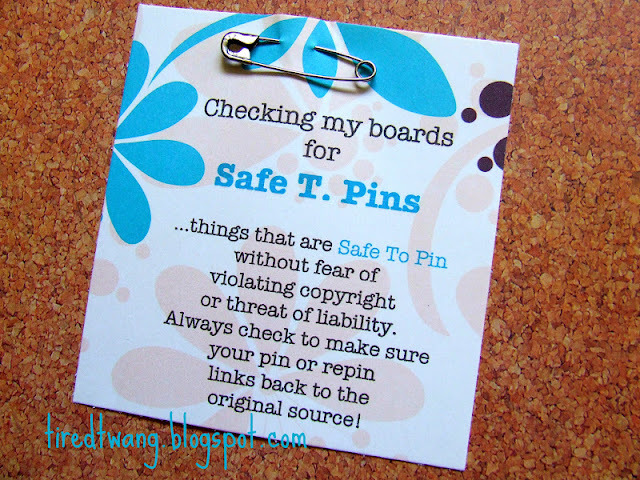 I am going to go through each and every pin I have and see whether or not it is something safe to pin. I was never a super user of Pinterest and only have 12 boards with a total of 110 pins. Yes, this means checking to see if the owner of the site I pinned allows pins or not. Sure it's easier to ask for forgiveness than permission but that's not the moral way, is it? I am obviously still going to allow my blog to be pinnable although if they can write a code that blocks it, why can't they write a code that let's you post a message when someone tries to pin your picture stating your preferences, ie... please don't pin pictures of my children or my dead great aunt's tombstone cuz that's just weird. That would be nice! In the meantime, I made this handy dandy little note to post on my boards to help me remember which ones I've been through and which ones I haven't. Feel free to pin it to yours too. Until I take care of my current pins, I'm not pinning anything new. You know, this might end up being a really good thing! Sometimes I feel like the repetitiveness of repinning just adds to the visual clutter. It was just so easy to pin things, but easy doesn't always mean good. I know it has already made me think before clicking that handy dandy repin button. I can't trust that the person who pinned it did the research so that means I will have to and that will make me take notice of what I pin or repin. Pinning with perspective... sounds like a plan. Here's a little update to the lawyer photographer blogger's original predicament. Looks hopeful! The Pinterest Predicament: Parts 1 and 2. I'm impressed with the response of Pintrest's creator in that link you shared. I have to think he will eventually sell it, for lots of money, because there has never been a better collection of consumer preferences and attitudes. Does it then become a monster like Facebook? My little blog is really just a scrapbook for my family, and I hate that my kids are indexed on Google images, even if anonymously...and yet I still keep posting. Pintrest makes me never want to get "good!" I added a Pin It button with a admonition against pinning my family. I'm always impressed with you Charlotte. I really can't think of anyone that I know "in real life" who is so devout (if you will let me use that word) , artistic and intelligent. I went through all my boards on Pinterest removing anything that didn't link back to the original source or that didn't have a 'pin it' button on the page with the image. I started with close to 2,000 pins and ended with...eight. That's all I could link back to original sources and have permission ('pin it') to use. That tells me Pinterest has some big problems. It would have been easier to just close my account. So, how DO you block people from pinning things? The very last question on this help page provides a code that will block pinning.